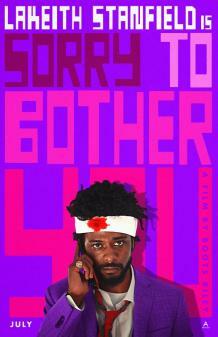 "Exploding with infectious originality, Boots Riley’s Sorry to Bother You may be the most wonderfully bizarre film of 2018. If you dig the handmade surrealism of Spike Jonze and Michel Gondry or the antiestablishment weirdness of Repo Man, then this one is undoubtedly for you. "Lakeith Stanfield (Get Out) stars as a down-on-his-luck Oakland striver named Cassius Green who takes an entry-level job as a telemarketer to scrape together enough money to live in his uncle’s garage with his performance-artist girlfriend, Detroit (a luminous Tessa Thompson). But rather than getting stuck in another dead-end gig, Cassius immediately vaults to the top of the ladder after adopting a 'white voice' (courtesy of David Cross) on the phone. Soon, he’s anointed as a 'power caller,' riding a golden elevator up to the corporate penthouse, where he cozies up to the backslapping, sarong-wearing CEO (a deliriously tongue-in-cheek Armie Hammer).